On New Year’s Day, I wrote about five trends, where public opinion last year shifted on issues that could change the political landscape. It’s time now to revisit those questions to see where we are, half-way through the year. The international debate of the last few years has been about whether governments should prioritise deficit reduction or growth. 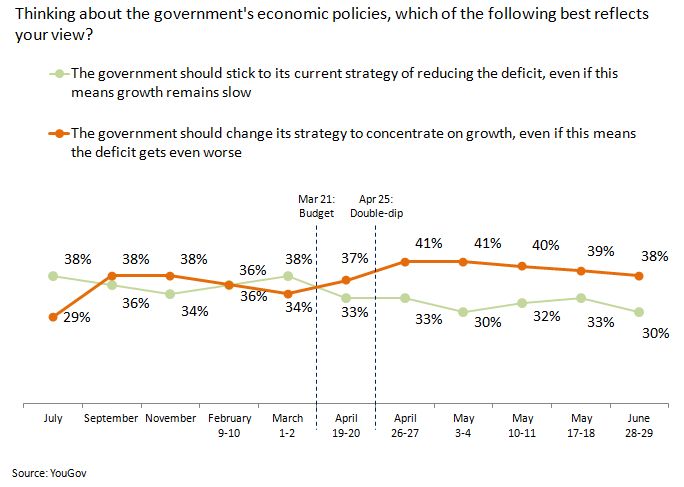 In the first few months of 2012, the deficit hawks were winning in the UK. But after the Budget, that lead was reversed, and since late April there was been a 6-11pt lead for those who say the government should prioritise growth. Labour’s central criticism of the government’s economic programme is that the cuts are not only going too far, but also are too fast. Over 2011, the proportion who agreed that the government was cutting too quickly fell from 58% to 48%, suggesting trouble for Labour. But this year, that trend has stopped. 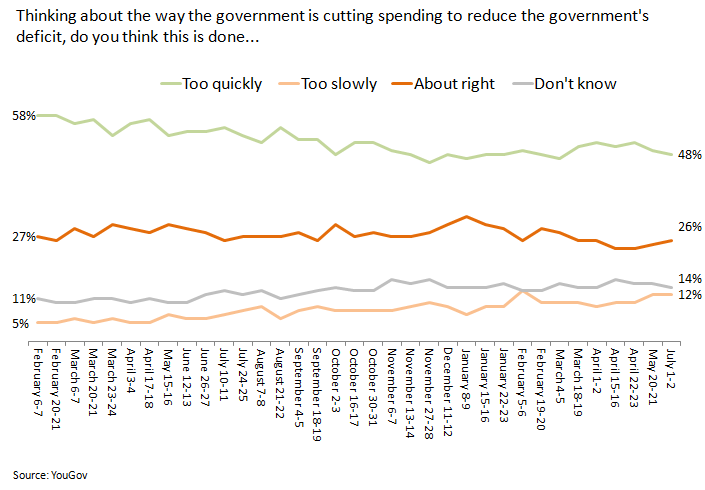 The proportion saying the cuts are too fast is about the same now as it was in autumn 2011. 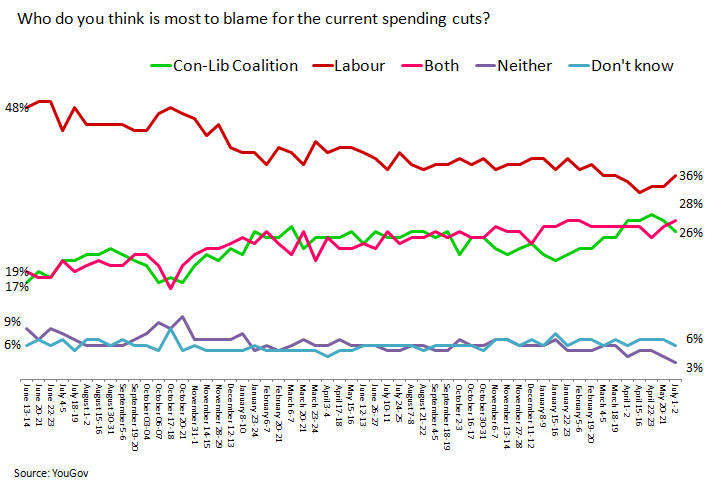 Views on who is to blame for the cuts showed little movement in 2011, with about 15pts more blaming Labour than the coalition. This changed after the budget, when the gap fell to single figures. Since then, it has been between 5-10pts. It’s interesting that the government appears now to be returning to the argument that they’re clearing up Labour’s mess, presumably in anticipation of making this central to their next election campaign. If so, this question will be increasingly important. Last year, the question of which party was most seen as ‘old and tired’ moved (in Labour’s favour), when voting intention didn’t change. 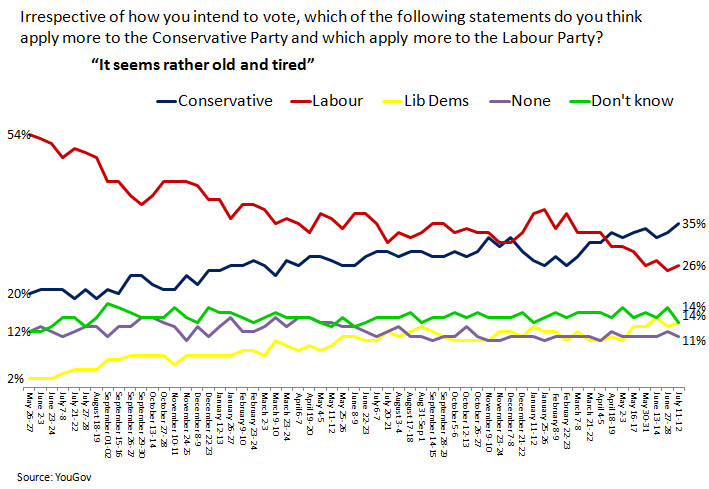 Now, Labour have established a lead on being seen as less ‘old and tired’ for the first time since the election. Unlike voting intent, this view has strengthened in Labour’s favour over the last two months, with Labour now having a nine-point lead. This is a problem for the government: being seen as worn out is dangerous territory for a party seeking re-election. 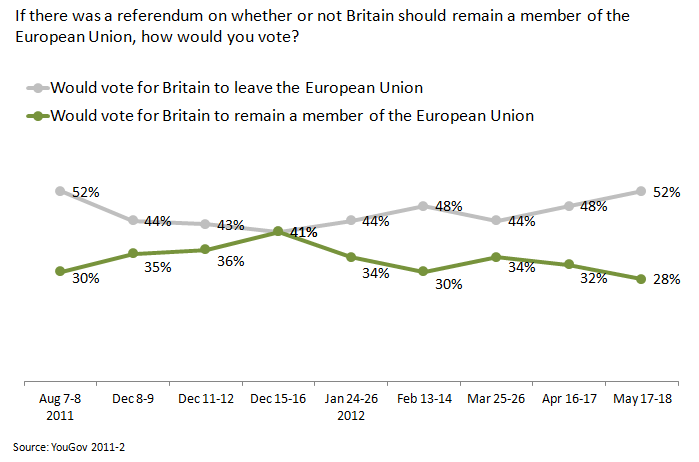 Britain’s desire to leave in the EU decreased towards the end of 2011, but this changed sharply after the turn of the year, with the anti-EU camp now 24pts ahead. That said, I don’t think there’s a lot that can be read into this question now. The nature of a referendum would depend so much on the deal that was on offer – whether the PM could negotiate an ‘improved offer’ for Britain to agree to – that a straight in/out question at the moment really only tells us that people don’t like the current situation in Europe. The first four trends here suggest good news for Labour. Recent polls have put them at between 7-11pts ahead of the Tories. But as I argued after the May elections, and still think, what we are seeing mostly reflects unhappiness with the Tories rather than enthusiasm about Labour. Having been an effective opposition on various issues, Labour have earned the opportunity to be heard by the public. But they has gained this primarily because they are the opposition to an increasingly unpopular government, and not because people are yet excited about electing a Labour government. This entry was posted on Sunday, July 15th, 2012 at 16:59	and is filed under Europe, Politics. You can follow any responses to this entry through the RSS 2.0 feed. Both comments and pings are currently closed.